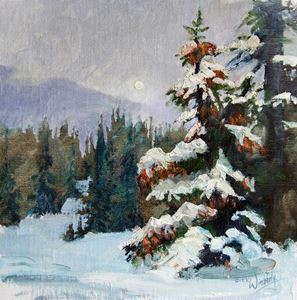 Congratulations to Peter Grab, who is the winner of the Winter Wonderland Online Contest. 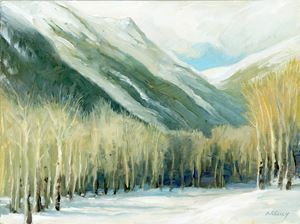 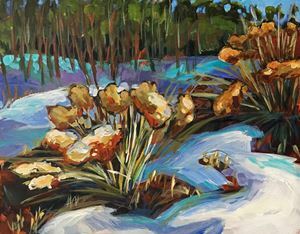 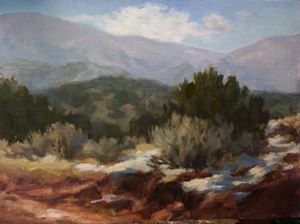 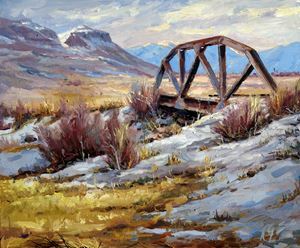 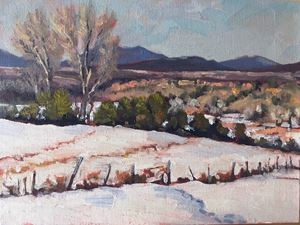 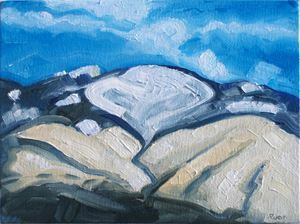 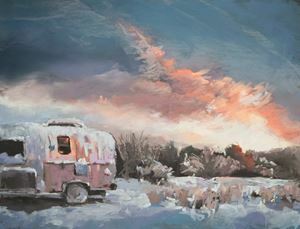 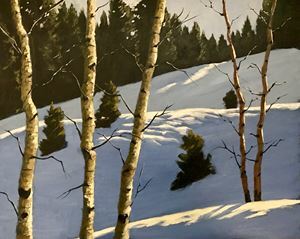 His beautiful painting, "On the Vista Tesuque Trail"(#23) was voted by you, the members as your favorite winter painting. 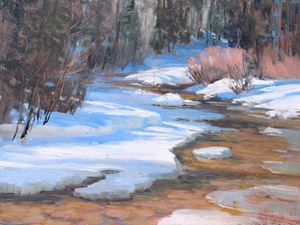 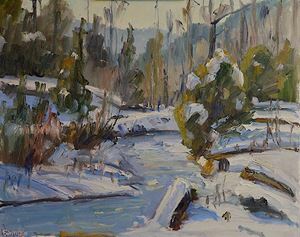 There were two other paintings that I must mention, as they were both next in line for the most votes, and they are Gary Kawalsi's painting, "Tesuque Creek Snow"(#15) and Peggy Immel's painting "Willow and Snow"(#17). 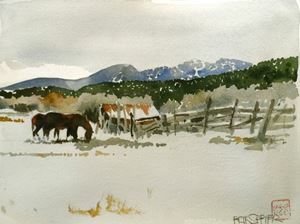 I must say this was a beautiful online contest. 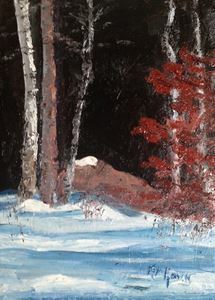 A big thanks to all of you who submitted paintings, and voted, as this made the contest work. 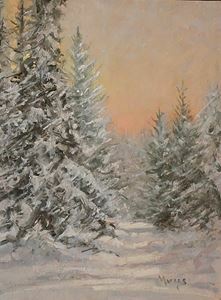 So Congratulations to Peter, and to all of you, for this beautiful Winter Wonderland Online Show. 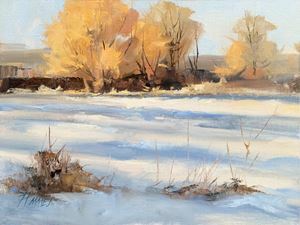 #2 -"Balance" - Jennifer Leon - 16"x24", Oil on Board, Monte Vista NWR, CO.
#5 - 60 DEGREES OF SUNRISE - Mary Ann Warner - 12" x 48" oil on gallery wrapped linen. 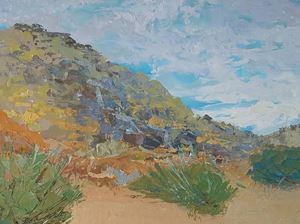 Location: Anza Borrego State Park, Borrego Springs, CA near corner of Hoberg Rd. 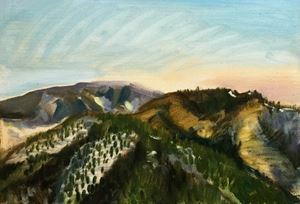 and Palm Canyon Rd. 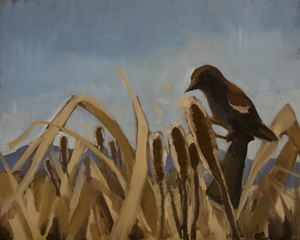 #7 - Lost and Found - Marcia Williams - 10" 7" oil on panel. 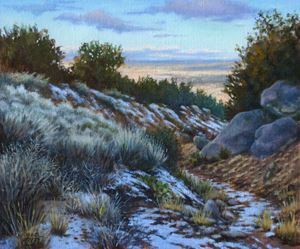 Location: above the Chamisa Trail. 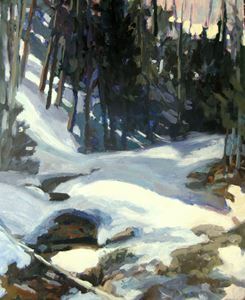 #10 - Wind Swept - Mark Akins - 16x20 oil Up Deer Creek west of Littleton, Co.
VOTED FAVORITE PAINTING: #23 - "On the Vista Tesuque Trail" - Peter Grab - 16" 20" oil on canvas , painted on the Vista Tesuque Trail near Santa Fe ski basin. 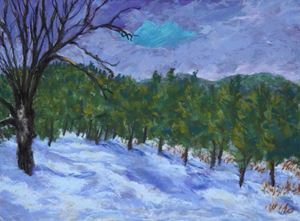 #26 - Silver Queen - Tobi Clement - 9"x 12" Pastel, location, my yard.